The Villa Montezuma was the home of Jesse Shepard who later wrote under the name Francis Grierson. Jesse Shepard was a celebrity in his day and passed away at the piano in Los Angeles in 1927. 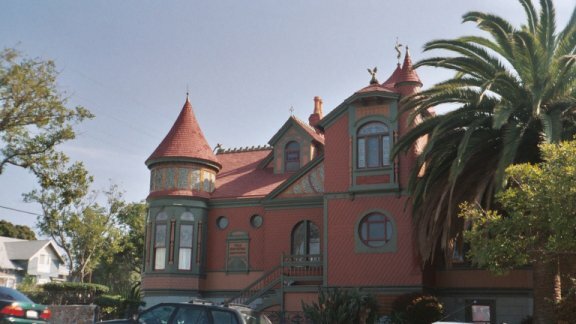 Noted medium and spiritualist as well as author, musician and singer, Jesse Shepard also had a hand in designing this beautiful Victorian home. Sadly the Villa Montezuma is closed and in need of repairs to the foundation of the house. Once the money is raised and the repairs completed it can reopen for all of us to enjoy. Whether you are a fan of the paranormal, history, or just have a passion for Victorians you will love this beautiful home. This Victorian used to be on the famous "Ghosts and Gravestones Tour" and it definately has a haunted past. Since Jesse Shepard was a medium this should not be a surprise.